The Dow Jones declined as much as 94 points in the early session after China announced the lowest economic growth target since 2004 and European services and manufacturing output was less than earlier estimated. However, bargain hunting activities recouped the Dow Jones’ losses to only 15 points amid encouraging economic data such as the February ISM non-manufacturing index and Jan factory orders. 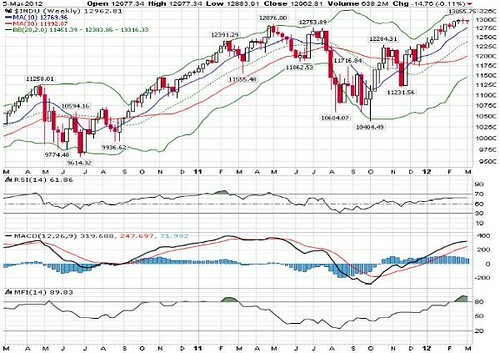 The Dow Jones was unable to move higher after surging to 52-wk high of 13087 on 29 Feb. Subsequently, it retreated to as low as 12884 before closing at 12963 overnight on profit taking consolidation after surging 25% from 52-wk low of 10404 in October 2011. 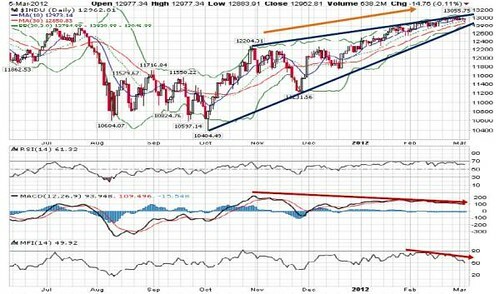 Technical indicators are showing divergence signals amid a rising wedge pattern. The rising wedge pattern is characterized by higher highs and higher lows with a contracting range, signaling an uptrend could end and a reversal pattern is in the pipeline. If prices fail to push above the wedge resistance over the next few days, selling pressure could accelerate and take prices lower.